As a married woman in 2018, my plight is, perhaps, not an uncommon one: I married a gamer (and I have no idea what I’m doing). Due to an unfortunate experience with Monopoly when I was but a babe of ten—along with a bit of a short fuse—I haven’t touched a board game in years. The mere sight of an instruction pamphlet lying atop a myriad of game pieces puts my nerves on high alert. I can’t stress enough that I am not a board game person. I do, however, understand the necessity of compromising with my spouse for the good of my marriage; so, I took a deep breath and unearthed the unfamiliar. We gathered with our friend, Wes, at our spacious dining room table (typically used for playing tabletop games with friends, rather than actual dining) to tackle Unearth, created by Jason Harner and Matthew Ransom and published by Brotherwise Games. When we lifted the box top to reveal a plethora of different game pieces, my brain almost immediately shut down. I was fully intimidated by this game. Wes and Adam, on the other hand, were giddy as schoolgirls, removing pieces from the box and admiring each as if it were a precious, shining treasure from some mysterious chest they had unearthed. Regardless, I steeled my resolve and tried desperately to focus and follow along as Wes read aloud from the instruction booklet. I felt utterly lost in a world of Ruins and Stones, cards and dice, and a process that seemed too complex to follow. The many moving parts felt so daunting to me, the newbie of the trio. But here was the light at the end of the tunnel: my companions were my saving grace in this adventure. I dared to speak up. “I don’t get it,” I mumbled, my brow knitted in ultimate frustration. I expected a backlash of annoyance at my confusion. Instead, I was met with reassurances and, to a point, agreement. We were all in the same boat, meeting the instructions with new eyes. But, as I was assured by my more seasoned companions, all would be revealed once we started the first round. And, thankfully, I learned the golden rule of board games: the first game never counts. I was ecstatic. The first few turns were a little shaky, but by the fourth trip around the table, I felt like I had actually caught onto the gameplay! After a few rounds under my belt, I was excited enough to enthusiastically approach another friend to come to the table and play yet another round with us—a definite (and surprising) first for me. The premise of Unearth is simple and classic: the world was great and thriving, at the peak of civilization, and then something happened. Quite literally. Your goal as the player is to rebuild and rediscover the wonders of your lost civilization. And, of course, your arsenal of tools in this undertaking consist of some familiar bits and pieces: dice, cards, and cardboard stones. You utilize these to gain Ruins and collect Stones, which allow you to earn different types of Wonders. Collecting ruins and wonders is what earns you points in the game. Each turn, you will roll a die. You may choose from an eight-sided die, a four-sided die, and 3 six-sided dice. Rolling low will earn you stones and rolling high will earn you Ruins. Each ruin has a point value that must be reached by rolling dice. Regardless of your roll being low or high, it will count toward reaching that point value and resolving the ruin to the player with the highest die roll. The players who have rolled for, but do not claim, a ruin card will receive a Delver card, representing your tribe. Delver cards are like little helpers; some let you reroll a die, others let you alter dice that have already been rolled (by you or the other players), but you must put them into play before rolling your die in the main, or excavation phase of the game, where you roll for Ruins. You can also build Greater and Lesser Wonders, which earn you points toward winning the game, and Named Wonders, which require certain Stone patterns to complete. These are achieved by arranging and completing hexagon patterns in your tableau, or collection of Stones and Wonders. Once the Ruin cards have been played through, you will encounter the End of Age card, which could simply be the last Ruin that the players must resolve, or an event that gives instructions to the players. Either way, it signals the end of the game and time to total up points. May the craftiest player with the Delver cards win. Artwork: I can’t stress enough how visually pleasing this game is! The colors, the illustrations of the different Ruins, the dark depiction of the End of Age cards… I could go on. Artist Jesse Riggle creates a minimalist dreamworld of ancient civilizations. Very fun to look at. A+. Multiple strategies: There are plenty of routes you can take as a player to get you to the end of the game. The scoring works in a way that compounds when you take ownership of multiple Ruins of the same color. But then, there are the Wonders earned by collecting the Stones with low rolls. It was great fun to play each round while focusing on a different point-earning strategy, and to try and decipher the strategies of my tablemates. Simple (enough) instructions and gameplay: When I sat down to flip through the instructions after playing, I found that they were very user-friendly and easy to navigate. As a first-time player who was unpracticed in board game playing, I think it would have been helpful for me to have read the instructions myself, rather than have them read aloud to me. The breakdown of game pieces, set up, turn order, and rules flowed very well, ending with a handy FAQ section. The game itself, once played through once or so, is not difficult to follow and does not take a terribly long time to finish. With 3 players, we averaged about 30 minutes per game. With that rate of play, we were able to fit in several rounds in the same sitting without tiring. Price: Honestly, this game is a steal. The cards, dice, and Stone tokens are all of solid quality, and can accommodate up to 4 players. The game is priced at just around $30, which I would call a bargain for the amount of fun we’ve had with friends and family—Unearth also accompanied Adam and me to a grilling session with family and made for a great after-dinner game. Unearth: End of Ages…or this Review. Overall, Unearth is one that I would highly recommend, especially for those that want a nice, easy (but still fun and versatile) introduction to gaming; it’s relaxed enough for families and other casual players, yet complex enough to hold the interest of more seasoned gaming veterans. I would go as far as to call Unearth my first favorite game. For those of you who, like me, consider themselves in the infant stage of board gaming, or you board game lovers out there who want to convert a non-gamer, I would highly recommend finding a good, supportive group of friends to game with, and giving this game a try. You can get Unearth from Amazon, direct from Brotherwise Games, or better yet, visit your FLGS. Check out more games for first time players here. And here is an interview with the co-founder of Brotherwise Games. 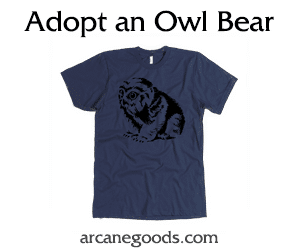 Who knows what sound an Owlbear makes? Seriously. Who?